DYNAMICA rope is the most compact Dyneema rope in the world. DYNAMICA rope is coated with a unique coating that ensures shape stability and increased abrasion resistance for longer working-life. The rope is heat-set under tension to ensure maximum strength, durability and uniformity. 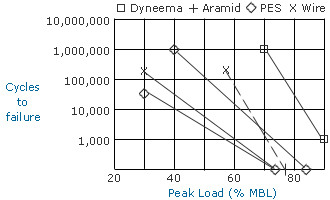 Dyneema is more than ten times stronger than steel per unit of weight. 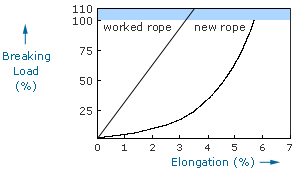 This means that a Dyneema rope has a slightly higher strength than a steel wire of the same dimension – but less than one tenth of the weight. * The above breaking strengths are the breaking strengths of ropes. Splices will decrease the breaking strengths by app. 10%. All the tecnical characteristics are strictly indicative. They can not engage the responsibility of Dynamica Ropes ApS. We reserve the rights to change them without prior notice. material for dynamic applications. 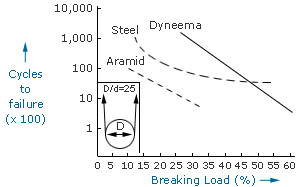 Dyneema has a very low elongation (2-3% at break). It stores little energy and has therefore little backlash – even at hundreds of tonnes of load. This is a very important safety-feature. Dyneema has a better stability to sunlight than other relevant fibres. After two years of exposure 80% of the strength is retained. Dyneema is resistant to chemical substances and will not be affected by oil acids or other substances. Dyneema has an excellent abrasion resistance compared with other synthetic fibres (five times better than polyester). Special care has to be taken, however, in order to ensure that it moves over clean non-rusty surfaces etc.Sharp edges etc. should be avoided.